Exhibition review published in ArtReview Asia (London), vol. 3 no. 1, Spring 2015, p. 102. Seemingly an adept of the occult arts, Laurent Grasso deploys a wealth of imagination to trigger our sense of the mystical and open up the possibility of hidden knowledge, hidden wonders, beyond the realms of empiricism or rationalism and at the crossroads between astronomy, religion and divination. Magic happens at the far edges of comprehension, the better to defy it, and Grasso noted during a conference held at Galerie Perrotin that string theory inspired him to believe in the existence of multiple uncharted dimensions to the universe (in addition to the four we know). He conjures them at the outset of Soleil Double, his first solo show in the gallery, introducing us to the hypothesis of Nemesis – an undetected star supposedly orbiting the sun and disturbing comets – with two large brushed brass discs hanging on the wall. Neophytes should be warned that the exhibition, which revolves around two new films (Soleil Double and Soleil Noir, both 2014), also immerses the viewer in an eclectic display of over 50 objects: neon pieces, sculptures, paintings, photographs, old books and antiquities. Whether the artist made them, borrowed them, purchased them or had them fabricated, you won’t know. No wall text informs their nature and provenance, so that your interpretation remains unbiased, the rite of passage all your own. The initiation takes you on a journey throughout no less than eight showrooms over the gallery’s two floors. 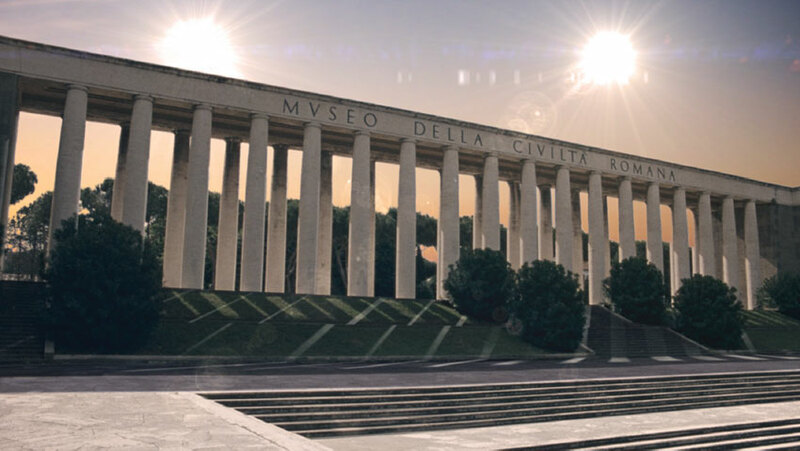 Back to fathoming the potentiality of new dimensions: the 11-minute film Double Soleil is a pompous crescendo of light beams upon the deserted Palazzo della Civiltà Italiana – an icon of Fascist architecture in Rome – at dawn. While long static shots present different points of view over the grandiose coliseum and its arches and statues, double shadows emerge here and there and a growing sense of unsettling strangeness keeps us in suspense until the very end: the rise of two stars, which, rather than bringing more light to the surrealistic scene, somehow makes the shadiness twice as great. But this eerie duality is only the first of numerous uncanny perspectives to unfold, as the 18 accompanying paintings of Studies into the Past (circa 2009–) suggest. This series, strategically undated, revisits the oil-on-wood techniques and pictorial style of fifteenth and sixteenth century Flemish and Italian painters. One of them depicts a parhelion in the sky above a medieval town. This is an actual atmospheric phenomenon, also known as ‘sundogs’, which causes two golden halos, looking like the sun, to form on opposite sides of the solar star: talk about our naked eyes challenging our belief! Or to quote an aphorism of Michel Foucault, to whom the artist often refers, ‘visibility is a trap’. The other paintings focus on more or less plausible disasters and miracles: earthquakes, deluges, blood and fire rains, passages of comets, (double) solar eclipses, ash falls and volcanic eruptions, hinting at the apocalypse or the unknown, like promises of new, unimaginable, horizons. This brings us to the second film, as surrealistic as the first yet immeasurably more sublime: the 11-minute Soleil Noir, shot partly with a drone in Stromboli, over the greyish slopes and incandescent ash bursts of its active volcano, and in the ruins of Pompeii, with a wandering dog as the sole guide and an unrelenting, haunting, electronic lament as the soundtrack. The sun only shows briefly at the very end, in an accelerated shot that makes it appear to be crashing rather than setting right below the volcano’s crater. A quick meteor shower follows and the image slowly fades to total darkness. This ‘black sun’ brings us back to Nemesis, which is actually said in the scientific literature to be a black dwarf star, meaning that it emits no light. In other words, you can’t see it, but does it mean that it doesn’t exist? After all, if anything feels definite amid Grasso’s obscurantism, it’s that truth is stranger than fiction.